Want a professional display way to market your company and its services? Our wall mounted SEG fabric signage includes custom printed full color artwork for featuring logos and promotional messaging. Silicone edge graphics are printed fabrics that fit tight into metal frames for a smooth appearance. This SEG fabric signage also includes LED backlights that boosts visibility and adds a modern touch. 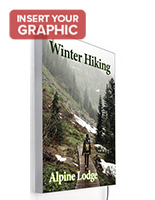 The lightbox signs create eye-catching advertisements in malls, hotels, and transportation terminals. 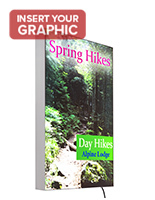 Stand out from the crowd with this sleek SEG fabric signage that features your promotional campaign. 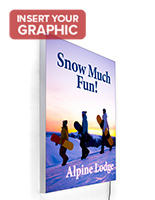 Why choose silicone edge graphic signs for advertising? SEG fabric signage features dye sublimation printing that creates vibrant artwork in full color. These high-resolution custom prints are ideal for portraying companies' logo and messaging exactly as they were designed. Dye sub printed images aren't just bold and accurate, they're also durable. Ink is embedded in the polyester at a temperature of 375°F. This also means that the material is safely machine washable. These stretch polyester prints have a modern presentation that can't be beat. Thin metal framing extrusions hold graphics at the edges — this hides all of the seams while keeping the image tight and clean. Advertisements appear to have an almost "frameless" design that puts all the focus on the message. Because it's made of polyester fibers rather than plastic or metal, there's no glare to distract from the display. This tension fabric signage comes with lights that illuminate custom artwork from behind. Passersby will be more likely to notice marketing with bright backlighting. Located in the edges of the frame, these LEDs create even lighting to complete the innovative advertising display. Light emitting diodes are the perfect choice for signs because they're bright and highly energy efficient. Easily raise your message's visibility while keeping electricity expenses down. 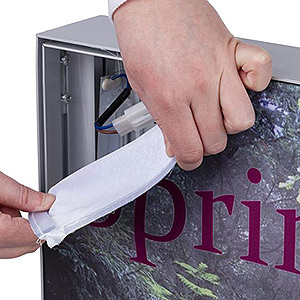 Our tension fabric signage lightboxes are easy to mount to walls, so there's no need to worry about installation. Each display comes with metal hanging hooks, wall screws, and plastic anchors for easy mounting. Each piece of the frame is numbered to assist with assembly as well. These illuminated signs don't need any additional hardware — they're ready to use out of the box! Looking for more signage frames for a truly impressive advertising campaign? We offer a wide variety of floor standing silicone edge graphic displays for trade show exhibits, retail stores, and corporate offices. This includes large backlit backdrops that are hard to miss on busy convention floors as well as smaller stretch polyester sign stands for shops and mallways. Our inflatable WaveLight® Air counters and towers feature custom printed marketing graphics in three dimensions, either as furniture or pop-up lightbox displays. Put your company's image in the best light with these cutting edge marketing solutions.